Most multinational investment banks with European headquarters in London should want the UK to stay within the EU. An exit would mean higher short-term costs, and might force them to relocate some staff to another European country, in order to ensure international clients have full access to the single market. Yet overt partisanship could unnerve certain clients who don’t agree. Many hedge funds want out of the EU, for instance. Nor is it clear the UK electorate cares much for what big finance has to say. JPMorgan and Goldman Sachs’ arguments in favour of Britain remaining probably won’t do much to sway voters. Personal views, such as Credit Suisse Chief Executive Tidjane Thiam’s desire to stick with the status quo, are a different matter. These should be welcome in the interests of open debate, even if they conflict with a company’s official stance. So it helps that Lloyds Banking Group’s Chairman, Norman Blackwell, can be vocal about the benefits of leaving, even if the lender he chairs is neutral. There’s a more important reason for banks to be wary, however. The proscriptions of Britain’s electoral laws for companies that do not register as political influencers are fuzzy at best, but sanctions for breaches are punitive. 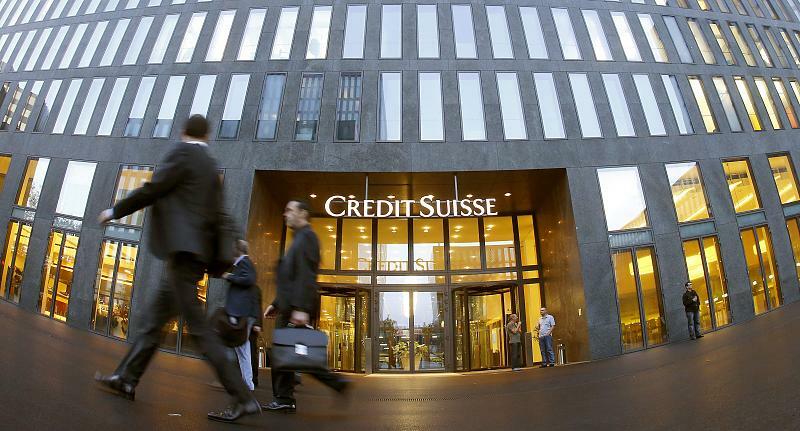 Credit Suisse’s fun police – Chief Financial Officer David Mathers and in-house counsel Adrian Ratcliffe – point out in their memo that these could include criminal liability for both the bank and individuals. Bank of America Merrill Lynch has also warned some staff about the ramifications. Other banks are likely to follow. The Japanese yen was the king in the past week, frustrating Japanese officials. Inflation data in the UK and the US, Retail sales PPI, and Consumer sentiment in the US, rate decisions in the UK and Canada, Employment data in Australia stand out. These are the main events on forex calendar. UK inflation data: Tuesday, 8:30. UK inflation increased 0.3% in February unchanged from the previous month. The reading was lower than the 0.4% forecast. Core inflation excluding volatile goods, also held steady at 1.2%. The reading stayed well below the 2% BoE target. UK inflation did not exceed 2% since late 2013. UK CPI is expected to gain 0.3% this time. US PPI: Wednesday, 12:30. U.S. producer prices declined 0.2% in February amid lower energy and food costs. However, prices were unchanged from a year ago, indicating a recovery. The reading followed a 0.1% gain in January. Energy prices dropped 3.4%, and gasoline prices declined 15.1% the biggest fall in a year. Nevertheless, recent manufacturing data suggests the sector is showing signs of growth. PPI is expected to increase 0.3% in March. Canadian rate decision: Wednesday, 14:00. The Bank of Canada kept its interest rate unchanged at 0.50% in line with market forecast. The BOC noted that the near-term outlook remains unchanged from January. The central bank lowered its economic growth projection for this year to 1.4% in January and cut rates twice last year to stimulate growth. It is likely that the BOC will wait for the upcoming federal budget’s fiscal measures this month to determine its next move. US Crude Oil Inventories: Wednesday, 14:30. Last week, US crude oil inventory plunged 4.9 million barrels to 529.9 million following a 2.3 million gain in the week before. Economists expected a 3.1 million barrels increase. The inventory fell due to growing demand from refineries and a drop in US imports. However, US crude oil inventories are 9.8% higher than in the same period in 2015. Australian employment data: Thursday, 1:30. Australian unemployment rate fell unexpectedly to 5.8% in February, from 6.0% in the previous month. However, the number of new jobs barely rose, increasing by 300, as 15,900 new full-time jobs were offset by the loss of 15,600 part-time workers. The unemployment rate declined since fewer people sought work and the participation rate fell to 64.9% from 65.1%. Australian labor market is expected to expand 18,600 jobs hwile the unemployment rate is estimated to rise to 5.9%. UK rate decision: Thursday, 11:00. Bank of England maintained its monetary policy and benchmark rate, noting the policymakers will refrain from changing its strategy before the referendum on EU membership, expecting growth would keep the same momentum this quarter as it had at the end of last year. The sterling has suffered from the uncertainty surrounding the UK vote and is likely to continue its descent in the near term. However, the Bank said rates will raise within the next three years. US inflation data: Thursday, 12:30. US Consumer Price Index, excluding food and energy, climbed 0.3% in February after a similar rise in January, raising yearly core CPI by 2.3% in the 12 months through February, the largest increase since May 2012. Economists expected a monthly rise of 0.2% and a yearly gain of 2.2%. Fed Chair Janet Yellen said the increase may be related to temporary factors but a gradual inflation rise is expected in the coming months. Even though consumers paid more for new automobiles, a 13% decline in gasoline prices, offset both the increase in core CPI and a 0.2% gain in food prices, causing CPI to contract 0.2% in February after being unchanged in January. Both CPI and core CPI are forecast to rise 0.2% in March. US Unemployment Claims: Thursday, 12:30. The number of Americans filing initial claims for unemployment benefits declined more than expected last week, indicating the labor market continues to strengthen despite lukewarm economic growth. The number of new claims fell 9,000 to a seasonally adjusted 267,000. Economists expected a reading of 271,000. This was the 57th week where claims remained below the 300,00 line, the longest stretch since 1973. The four-week moving average of claims rose 3,500 to 266,750. A report showed hiring by U.S. companies surged in February to the highest level since November 2006. The number of new claims is expected to rise by 270,000 this week. US UoM Consumer Sentiment: Friday, 14:00. The UoM preliminary consumer sentiment index reached 90.0 in March, compared with a final February reading of 91.7. Economists expected the February index would rise to 92.1. Despite the surge in January, consumers became more concerned about economic growth in the U.S., financial market volatility and turmoil abroad. Consumers no longer believe the economy would grow beyond 2.4% this year. Economists expect consumer sentiment index to rise to 92.3 in April. Last edited by 1Finance; 04-09-2016 at 07:04 AM. 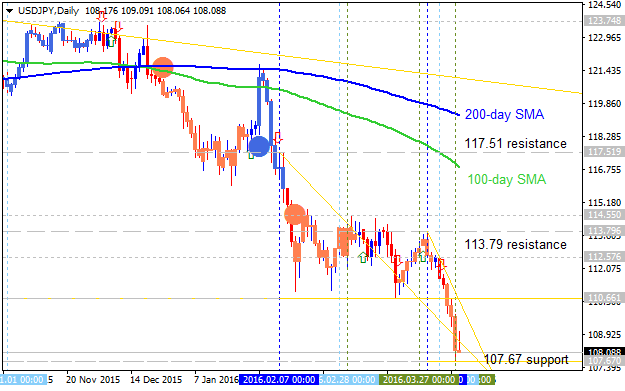 USD/JPY: bearish breakdown. The price is located to be below 100-day SMA and 200-day SMA for the primnary bearish market condition: the price is on breakdown with 107.67 support level as the tager for the bearish breakdown to be continuing if broken. Alternatively, if the price breaks 113.79 resistance level to above so the bear market rally will be started within the bearish condition with the good possibility to the reversal of the price movement to the primary bullish market condition if 117.51 resistance level will be broken to above.